It’s a lovely Sunday morning. You can sleep in, laze around in bed, and not hurry to work. But just one phone call completely changes the life of Kelly Stanford. An ordinary girl who works as a make-up artist in a film studio suddenly becomes the focus of incredible adventures. With Kelly you will go on a fascinating journey, find yourself on a tropical island, solve the riddle of her parents’ disappearance, defeat the bandits, savages, and cannibal native tribes. Once you have beaten more than 360 levels, containing match3 puzzles, you will ultimately learn why Kelly’s boss decided to kidnap her and how the adventure ends. The story of Kelly unfolds in a splendid and colorful cartoon form and the incredibly compelling gameplay will never let you get bored! You will be able to share your exciting adventures with friends on your favorite social network, and they will always help you to get the necessary items and lives for the game! 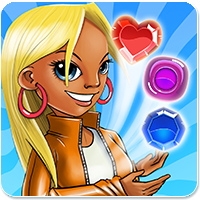 'Kelly Stanford Adventure' is a completely free game, all levels can be passed without any additional purchases. But you can always buy extra lives, moves and bonuses to achieve the most impressive results.